Celebrating their win at the 12th annual Sidney Altrusa International Adult Spelling Bee, are, left to right, Eric Shoemaker, Vera Piper and Kim Cecil, all of Sidney, who comprised Ohio Living Dorothy Love Team 2. They bested eight other teams and took the trophy, a crocheted bee, by correctly spelling “edamame” and “diminuendo.” The runner-up team was from Christian Academy Schools. 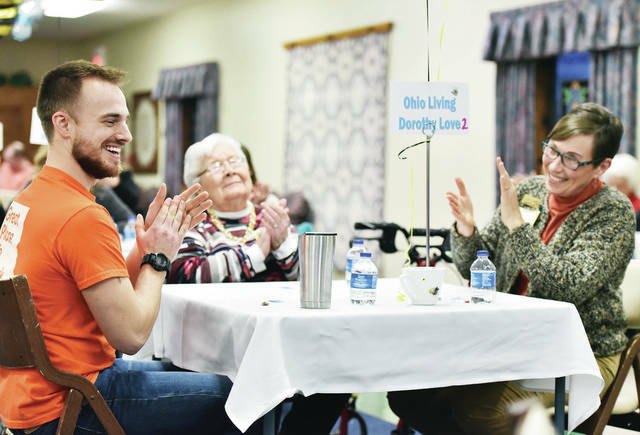 The Altrusa fundraiser took place in the Amos Community Center at Ohio Living Dorothy Love in Sidney, Thursday, March 21. Proceeds will support scholarships awarded by the service club.